Now, what do I do? That was the first thought that formed in my mind when I first opened Gimp about 5 or 6 six years ago in an Internet cafe on F. Ramos St. in Cebu City. I was given the grand tour on Linux and open source software by Mike Schmeisser, a chain-smoking German geek, in his Internet cafe. His Internet cafe ran, save for one unit, solely on Linux. I interviewed Mike for a story on open source software and Linux and he invited me to his cafe to check his units. PHOTOSHOP ON UBUNTU LINUX. 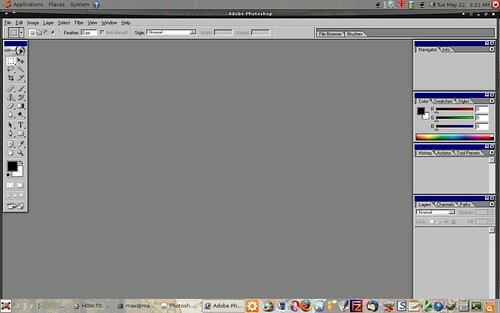 Adobe Photoshop 7.0 running in my Linux laptop using Wine. Click on photo to view larger image. Having been reared on image editing with Photoshop, I couldn’t find my way in Gimp. I’m not really a graphics person but I use Photoshop often for editing photos, editing images of screen activity for tutorials, and creating blog and website headers. I tried various open source software after Mike’s introduction and even stuck with using many of them. But not Gimp. I once tried Gimpshop, a modification of the program to replicate the look and feel of Adobe Photoshop but then I found myself using Photoshop after a few days of playing with it. More than a month after I switched to Ubuntu Linux in my laptop, I found that I missed having Photoshop in it for certain tasks. I did manage to create a blog header using Gimp but it took me at least ten times longer than it would have taken me in Photoshop. I had a hard time even resizing images in layers or removing backgrounds of photos.